Airfare A La Carte: Has the airline ticket become a loss leader? As airlines continually try to boost their revenue in this down economy, Southwest Airlines has announced that they plan to raise certain fees for baggage (third bags and overweight ones) and “early-bird” check-in. This is significant because Southwest has always billed itself as the airline without hidden or additional fees – yet now even they see the benefits from charging for add-ons on top of airfare (their AirTran subsidiary is also raising its existing fees for baggage and other items). More surprising, however, is that they also are planning a “no-show” fee for passengers who fail to cancel a ticket prior to flight time – a first-of-its-kind fee in the industry. This is from an airline where flight costs were fully reusable, with no change or cancellation fees. They say that this will only apply to the lowest fare classes and is only meant to encourage passengers to release space that can then be resold. Southwest certainly is not the first to charge ancillary fees – most major airlines started doing so in 2008, when American started charging $15 for the first bag checked. Over time, fees jumped higher and broader, to offer things like lounge access, extra legroom, priority security lines and earlier boarding – perks and services previously only available to frequent fliers or via membership. And, lest we think these fees are ridiculous, there are airlines out there that have built their model on selling the extras. Spirit Airlines charged for bags, beverages, and food well before 2008, and currently offers 8 pages of extras on their website; Ryan Air (a European budget airline) not only charges for literally everything, they have removed seatback pockets and window shades and covered headrests and tray tables with advertisements. They have even “joked” that they would charge for the bathroom if they could find a way. It seems likely that the cost of airfare may soon become just the minimum cost of entry, with airlines barely breaking even (or losing money) on the ticket price itself just to sell all of the upgrades and extras. The true cost of traveling by air may become more like buying a car: sure, you can just pay the base price for a seat, but don’t you want the extra legroom and the rustproofing? 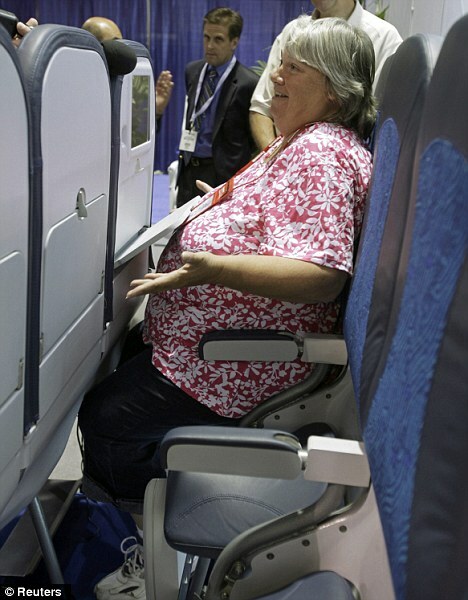 A number of articles even discuss airlines installing premium and/or extra-legroom seats in the front to increase revenue, while squeezing smaller seats and reducing seat pitch in regular economy in the back. However, while the airlines have enjoyed the added revenue (indeed, it has kept some of them in business), they have lost big in customer satisfaction. Proponents of the fees claim that it allows travelers more choice in customizing their experience; it also keeps the base ticket price affordable than the ‘true cost’ of a flight. As a leisure or occasional traveler, how do all the additional fees affect your choices? Do you prefer the choices of the “a la carte” approach, or would you rather pay a higher all-inclusive fare? For the frequent fliers out there, how do you feel about regular fliers being able to purchase the perks that were once only available to the elite? It seems to be a fairly bold statement, seeing as Apple and RIMM have dominated the enterprise market in the recent years. In fact, Apple was said to have recently passed RIMM (Blackberry) as the leading provider of company-issued smartphones and could maintain that position through 2016. 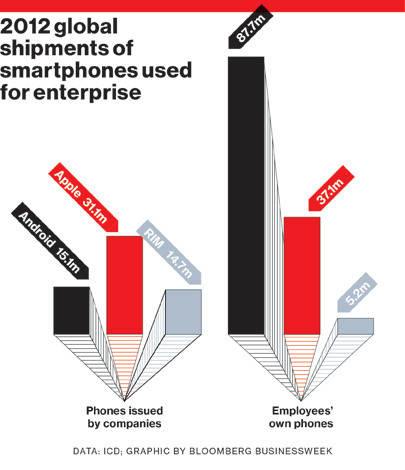 (BusinessWeek). The overwhelming majority of large companies are testing iPhones and iPads for employee use. On the surface it would appear that the barrier to entry in this market is very difficult, if not almost futile. How could Samsung possibly think there’s an opportunity here? The answer is customization. Apple has a history of cutting edge products, but ultimately doesn’t customize ANY of them. What you see is what you get, and for most, this is quality product that needs no customization. However, Samsung sees an open door. So many companies are now looking for enterprise solutions that will best fit their structure, and Samsung feels it can meet these demands better than Apple or RIMM. By being open to customization as well as working with third party vendors to target specific industry’s needs, Samsung plans to fight to become #1 in enterprise solutions. The company is taking a good hard look at competitors like HTC and even Google, and notice that neither seems to be interested in the enterprise space. The business strategy seems to be to attack a market segment that has not yet been saturated. Of course, to play in this segment, Samsung must be prepared for the new challenges it will bring. For example, an advantage of Android is that it’s highly customizable. However, it can be a disadvantage for the same reason, making it difficult to standardize security and management software to sell across multiple corporations due to so many different versions of Android currently available. To address this challenge, Samsung has already invested in designing its own software for this purpose which will make all Samsung devices operate consistently. Samsung will have other challenges to consider as well. For example, the company will need to be sure to market to corporations accordingly to re-brand itself as an enterprise solution provider. Also, it will need to continue to offer a sustainable competitive advantage over time. Finally, resources will need to be reallocated or added to support corporations’ customer service requirements as well as to meet their customization needs. How do you think Samsung will perform in the enterprise market? What would you say your biggest concern would be if you were the CEO of Samsung? Wayne Gretzky said. “I skate to where the puck is going to be, not where it is.” This statement not only applies to hockey, but also to the business world. In an age where Big Data is becoming increasingly important, people continue to struggle with forecasting. Data as a platform is quickly becoming an industry of its own. Businesses are being formed around meta-data management, enterprise performance management tools, data warehouse utilities and search engines. However, people still struggle to accurately forecast. These tools are great, but they are just tools. There is a human element that also exists. During our competition, some of us knew how other teams would react because we know them well. These decisions can’t be found in a spreadsheet or queried from some place. We are forced to know our customers and our competition at all times. This information is invaluable. What’s the size of the market and how fast is it growing? What types of opportunities are there for the company? How much money will the company need to borrow? John Vanston did some work around forecasting. He created a model bringing Forecasting, Foresight and Strategy together. 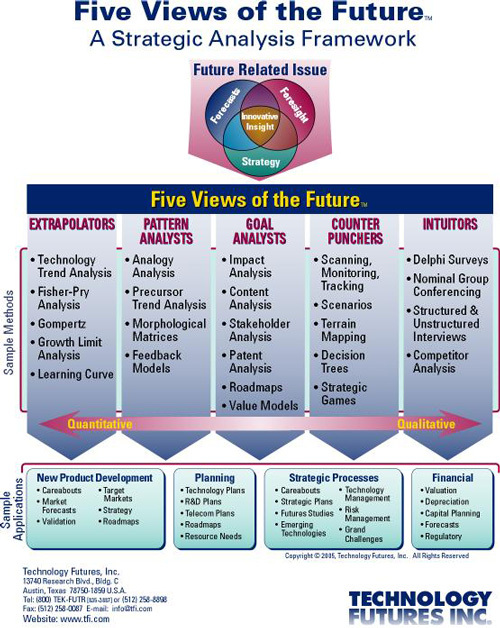 This model gives us a view ranging from heavily quantitative to more qualitative approaches. (Byron C. Anderson 2012) This helps students understand what is needed to decipher the data around us and I’ve provided a picture of his framework below. After my recent experience and reading a little more about forecasting, I wonder if there is a need for a required class within the MBA program. This isn’t a challenge for one particular industry. It can be applied from manufacturing to finance to sports (as evident with the recent movie Moneyball). I believe forecasting is more than just numbers. It’s an art. Who’s making decisions and why are they making these decisions are just as important. In a constant world of pressure for margin, having accurate forecasts could mean the difference between staying in business or not. 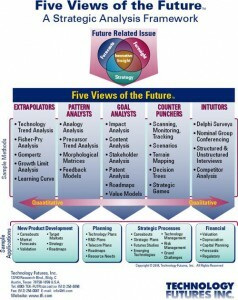 What are your thoughts about forecasting as a mandatory course for MBA students? What experiences (Good / Bad) have you encountered at work with forecasting? Airline industry experts have been predicting increased consolidation in the airline industry for years now, as unpredictable volatility in oil prices, high labor costs, and an overall softened global economy have left some carriers with few options other than to be gobbled up by carriers who are on stronger financial footing. Delta Air Lines, America’s second largest airline recently announced their intent of purchasing 49 percent of Britain’s second largest carrier, Virgin Atlantic, to help strengthen the trans-atlantic market share held by Delta. The airline is purchasing the 49 percent share of ownership that is currently being held by Singapore Airlines, with founder Sir Richard Branson retaining the remaining 51 percent of ownership. Behind this transaction are coveted and extremely valuable London Heathrow landing slots. Heathrow, despite being one of the worlds busiest airport, is actually slot-controlled which means that there is a limit as to how many flights (or “slots”) available for airlines to fly in or out with. Because supply is effectively controlled by airport administrators, fares to Heathrow are typically higher and include a premium related to the high demand for seats that many corporate business travelers don’t mind paying to get access to London’s best geographically located airport. The partnership will provide a stronger competitor to the American Airlines – British Airways alliance that currently controls 60% of the London to United States market (with this alliance expecting to control an estimated 25% of traffic). The two airlines are also hoping to achieve anti-trust immunity that American and British Airways both currently have, which will legally allow Delta and Virgin to share their schedules, prices, and strategize together on trans-Atlantic operations which provides a real competitive advantage as the resources of the two airlines will be effectively utilized as one large carrier. Delta and Virgin have signed an agreement where they will share both the revenue and costs from their London to the United States flights. Another advantage for Delta in this deal is that like their U.S. competition, Delta is strategically interested in dominating the New York airline market, which is difficult to do if you don’t have a strong presence in New York’s second largest travelling destination in London. This partnership will allow Delta to strengthen their New York operations by being able to offer lucrative corporate travelers better access to London’s Heathrow. Not only that, some analysts are saying that the real value in this partnership is actually the ability for customers to connect in London to other destinations throughout Europe and Asia on Virgin, giving the airline an effective and valuable hub in London that it never had before. Delta Air Lines has transformed themselves into an industry trendsetter, with recent investments in oil refineries to produce their fuel in house, in addition to bucking the industry trend and leasing older but extremely cheap and reliable aircraft to expand their fleet. Time will tell whether these strategic decisions will pay off or burden the airline with higher costs. One thing is for sure though; their new-found access to the London Heathrow market is now the envy of their competition. Facebook has announced its inability to monetize the more than 400 facebook members who access the site via a mobile device. As part of their public offering facebook had to reveal risks that the company faces in the upcoming years and one that they highlighted is their inability to generate meaningful revenue through mobile devices. Overall spending on mobile advertising in the US is expected to jump 80% next year to over $2.6 billion and facebook needs to find a way to capture a large chunk of that spend if they want to continue to be a powerhouse in the tech industry. Although a large number, the mobile advertising industry is still very immature when compared to TV, print and online advertising. The inability to generate significant revenue on mobile advertising is not unique to facebook as other large companies are struggling as well. Although facebook has listed their inability to generate significant revenue from mobile devices as a risk many believe that facebook is deliberately delaying ads on mobile devices, similar to their strategy with the traditional facebook website. This article brings up several interesting points about the mobile advertising market. This market is poised to grow over 80% in the upcoming year; however marketers still do not know how to fully capitalize on this market. According to the article and several other experts consumers are not yet ready for advertising to appear on their mobile screen. In most cases mobile screens are much smaller than those on traditional PC’s and consumers do not want to see clutter on their phones and they do not want anything to jeopardize the speed at which they pull up content on their mobile devices. Google is currently the leader in mobile advertising however they are still not fully capitalizing on the vast potential that this market offers. Another interesting point that this article brings up is the other ways that companies like facebook can make money on mobile devices. Currently Google allows developers to great apps and games and offer them on their android platform free of charge while companies like Apple and facebook charge a percentage of app sales from each developer. This is one reason why facebook was reluctant to create and Ipad app for facebook because now facebook needs to share revenue from faecbook apps with Apple. With the current model and fight for dollars in the mobile market there are several battles going on within the war. For instance many believe that facebook deliberately created their Ipad app with bugs so their members will just access facebook via the web directly versus the apple app. This would be a very interesting strategy especially because facebook openly admits that over half of their users access their website via a mobile device. It is obvious that there is still great potential to be reached in the mobile market and facebook is testing models with streaming advertisements that are attached to a member’s friend. The question that still remains is facebook’s current mobile strategy one that will make this segment profitable? Facebook must make a lot of strategy decisions in the upcoming months and two of the most critical strategies will be how much resources to devote to mobile and how to attack this segment. If you were facebook how would you attack this segment? You can access this article at the link below. The process of using 3-D printing in the manufacturing industry is known as “additive” manufacturing whereby the manual construction of a prototype is known as “subtractive” manufacturing. This is because utilizing software to print a prototype saves a lot of retooling costs that would otherwise eat up a large portion of the R&D budget. 3-D printing also saves time and raw materials since the printer is more precise and more efficient than cutting, molding, soldering, etc. by hand. Not only does 3-D lower costs, but it also lowers risk associated with developing a new product. Before, a manufacturer would have manufacture and sell hundreds and even thousands of a new product just to recoup the R&D and manufacturing costs. With 3-D printing, the break-even point is lowered substantially. This is good for consumers as well as more unique products may be brought to market for consumption. Another cost savings of 3-D printing is the reduction of scrap waste. During the normal manufacturing process, sheets or coils of steel may be used and the edges are considered scrap after the shape of the product has been cut out of the sheet/coal. With 3-D printing, you hit a “print” button, much like a typical ink-filled printer we use today at home. However, there is no scrap because the 3-D printer prints in layers, and only uses the raw materials necessary to make the object. This article mainly discussed the 3-D printing of airplane parts, but there’s no telling how far this new technology will take other industries as well. The world of 3-D printing is pretty amazing. I was pretty impressed with the concept and found that it has opened a lot of doors for a lot of people. Hobbyists such as jewelry makers can utilize a 3-D printer to print their designs. What was once a hobby can perhaps turn into a small business. And an architect at MIT is experimenting with the possibility of printing buildings! In her experiment, the 3-D printer is able to print layers of concrete for the building construction. Furthermore, human organs have even been printed with a 3-D printer!2 Ten years ago, a young boy was given a printed bladder. The bladder was printed using a combination of synthetic, biomaterials and the boy’s own cells. The boy would go barely go outside for recess and had been on dialysis for ten years went to become captain of his high school wrestling team and is now majoring in Communications at the University of Connecticut. His quality of life improved drastically due to 3-D printing. Other 3-D organs are currently undergoing testing before being approved for transplant. In summary, I think the possibilities are endless. It’s hard to believe that this technology has actually been around in manufacturing for at least ten years, but it’s not hard to see that it is taking off rapidly (and with great success) in many fields. It’ll be exciting to see what comes next! Which industries do you think 3-D printing may have the most impact on?